Do you store important data for your personal and business use ono your Lenovo mobile phone? If you do, you may have experienced accidental data loss problem from your mobile, something that can make you crazy and frustrating. Yes, it is common for users to save their pictures, text messages, videos, audio files, contacts and various apps on a phone, and it brings you troubles if they are lost or deleted on the mobile. 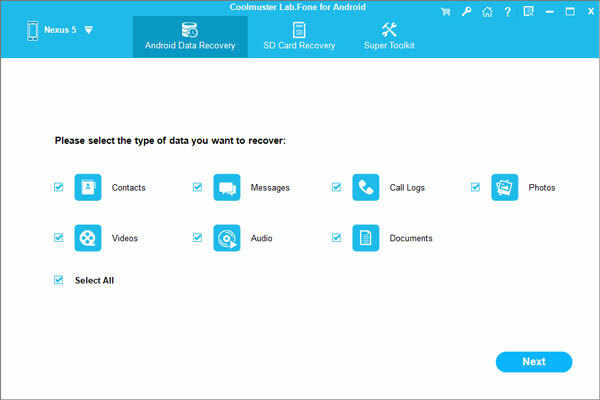 Today, a reprieve is coming for all Android smart phone users and it is Coolmuster Lab.Fone for Android - a reliable Android data recovery program to help you recover overall file types, such as contacts, SMS, photos, videos, music, call logs, documents and more from Android devices as long as the deleted data has not yet been overwritten. When you find a file is deleted on the phone and you want to recover it back, you must stop using the phone until it is retrieved. This Android data recovery software support all Lenovo devices, including Lenovo A390, A7000, K80, A6000, K3,Tab, S60.etc and more. Just take the free trial version of the software to have a try now. How to Recover Lost Data from Lenovo Android Devices? After you downloaded and installed the program on your computer, launch it and you will see the initialization interface below. You will be asked to connect your Lenovo phone to computer via USB. 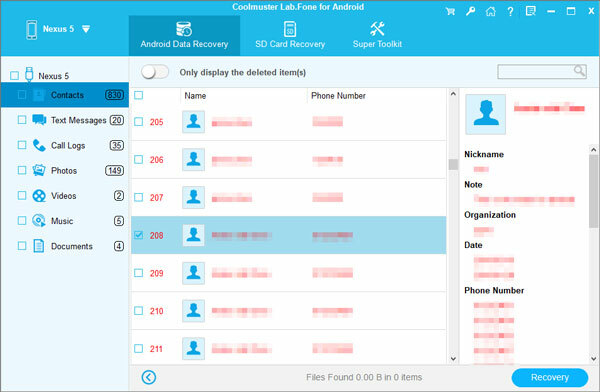 Select the file types you want to recover from the main interface and the Android data recovery software will start to scan the connected Lenovo phone to find the files you want. Preview the scanned out Lenovo data and select those you want to recover. Then, you can click the Recover button from the bottom right to save the recovered Lenovo phone data on your computer.